Home	/ Advanced Intimate Relationships • Healing and Moving Into a Zion Society • Healing Children and the Child-Like • Healing the Body • Life's Mysteries Un-Sealed • Loving Others • Loving the Self • My Story • Raising the Sons of Earth • Raising Whole Children • Uncategorized / The Two Trees in the Garden. Part 4. Forgiving and Turning from the Tree of Knowledge (fear and judgment) to the Tree of LIFE. Krystal shared with me this morning a snippet that she remembered from her night’s dream in which she had hugged and felt close to David. Earlier this morning, she had stood on the scale and had lost five pounds overnight, going from 154 to 149. A coincidence? I don’t think so. Here’s more of the story. Shortly before her fourth birthday, I received my “call” to “sell everything and follow Christ,” that I was “needed in South America.” See my post where I share more of that experience here: ( https://loveistheanswer.info/l-o-v-e-part-4-l-o-v-e-in-action/ ) Krystal and I boarded the plane to Ecuador soon after she turned four. That decision to follow my inner guidance even and especially when so unprecedented a call was profoundly beneficial to changing everything in my world, bringing me closer in every way to who I Am in the eternal scheme of things. Nevertheless, with that choice, many other course-attunements followed which brought me further and further away from “the beaten path” that “normal” mortals walk. And through it all, Krystal has walked beside me. Though Krystal’s life has certainly not been the “cookie-cutter” American child’s childhood, she has always felt safe and secure, loved and respected… no matter what our current “shelter” or physical situation. Nearly five years ago, David entered into our lives. Please hear: I have tremendous love and gratitude for him. He is a precious human being and our personal connection is eternal and strong. I will love him forever. However… his entrance into our lives, brought phenomenal opportunity for the three of us (and many others) to shift and change even more, and… potentially learn. Krystal was thrilled to finally have a “daddy.” Yet, not having become emotionally strong nor yet willing to KNOW his actual, empowered and integrous True Self, David brought with him learned counterfeit ways of interacting with life and others. Within a short time, Krystal began putting on pounds for emotional protection as her eyesight additionally quickly shifted… to become nearly identical to his. In this, her spirit was saying: “I want to see the world as he does. I want to understand him. I want to be loved by and accepted by him.” He offered her his back-up pair of glasses. Though they each tried, to form a mutually respecting relationship, to the degrees that they were able, Krystal never felt completely safe or validated. She quickly put on excess weight as an emotional “shield and protection” to her heart. When Krystal and I moved to Salt Lake City this summer, she was up to 162 pounds. Although she has tremendous resilience and a vivacious love and respect for all people, to carry this weight on her 5’2″ frame, felt uncomfortable and she vowed to rid herself of it and to return to balance in every way. However, though she ate “an apple a day” and salads and otherwise healthy food, her excess weight was persistent. When her ninth-grade year began, she was hired as an after-school janitor. This extra physical activity and the long hour days meant less time to eat and less appetite. In the 10 weeks before we moved and it was required that she terminate her employment, she had managed to lose eight pounds. While showering this morning, as is often my experience, neurons connected within my brain on a subconscious level and I was gently opened up to “intelligence” that “I,” Kimberly had not yet put together. I was shown how integrally connected Krystal’s excess weight has been with her feelings of being unsafe with and invalidated by David. Please realize: David is a beautiful human being! He did the best that he was currently capable of to accept Krystal in his life, providing the kindness, the physical and relationship skills that he had at his disposal. We both love and appreciate him dearly! However, without having earnestly undertaken his emotional curriculum and applying the “Sermon on the Mount” (Matthew 5: 3-12 especially, where “Jesus” teaches the “Stairway to Heaven,” or rather, the path to emotional/ spiritual adulthood), living in close contact with his emotional volatility created Krystal’s perceived need for self-protection. No longer living in close physical contact with him, Krystal has been able to regain her self-respect and feelings of safety. Because of the personal nature (of the other persons) of what I have just shared, I pondered deeply before including the above in a public post. Yet, my role is transparency and assisting all of humanity… as each prepares him or herself, to gain emotional maturity. I feel our experiences are meant to give insight and encouragement to others. Plus… each of the two individuals in the above scenario have given permission and are aware that their lives are meant to and will be used as I serve all. Recently, I felt guided to organize a small group “Prayer Circle.” Meeting regularly, we become “One,” and unify our focused attention upon certain individuals that we feel impressed need healing light. With pure intent, and with one mind and one heart, we gratefully shower warm Light into these individuals and their needs, whatever they be, as well as to more general situations. I will speak more of our “Prayer Circles” in the near future, but suffice it to say, both Krystal and David have been subjects of our loving healing intention. Krystal’s recent “miracle” is one of several indications of Light having been received and utilized. I feel very grateful. Krystal’s “dream” this morning, simultaneous to such a significant drop in weight, are both connected to her participation in these prayer circles in addition to the conversations she and I have had teamed with her desires to only have love and respectful feelings in her heart for David and all others. Truly, the physical and emotional and mental aspects are all inter-related and dependent upon each other for health and balance. When one part of our self heals, the others align as well. Especially as Krystal has been sincerely and actively pouring out her love for David, the energy-rebound effect requires that she realize healing as well. She received most welcome proof of that this morning! As backwards as this seems… Who wins a grand prize before even competing? !… this is the set-up for mortal life. Consider that when one enters life as a mortal, the physical body IS the Grand Prize and that keeping it complete and in tact through one’s emotional development is the objective. This is my proposed actuality. “Before the last rose petal falls” was the symbolic time appointed the “Beast” in the story “Beauty and the Beast.” And it was during that time frame that he had to realize mutual love with another. Here we have another clue hidden within a child’s tale. Various religions claim belief in the physical body being a “temple to the most high god,” yet they have lacked the understanding of WHO that “most high god” IS and HOW to “worship” that god within their Temple. Yet, the promise has been given that they “should run and not be weary, should walk and not faint, and that the destroying angel should pass them by.” Additional promises for the body include: “Health in the navel, marrow in the bones, strength in the loins and in the sinews, power in the priesthood” upon their self and their biological and spiritual posterity. It is rare that a religious individual even fully understands their stated promises. “Priesthood” (“the power to act in god’s name”) is nothing more or less than utilizing Intelligently and Wisely the pure Light within them self to assist the needs of others. Others sing and express belief that they are a “Child of God,” yet few connect the rest of the dots to realize that children are intended to grow UP and become of the same species as their “parent.” IF a parent is a “God” then that makes the child an immature “God.” And the immaturity is in the emotional realm. Thus, “Jesus'” curriculum is for the “poor in spirit” to gain emotional wealth through mastery of their emotions (Matthew 5: 3-12). Few people in our culture today know any who have overcome death. Yet, death is the “final exam” for mortals. Of those stories floating around within mainstream awareness of the occasional individual who “translates,” most are scoffed at or chalked up as just that, “stories.” Thus, one after another falls into the ditch and is buried, having not realized the “fullness of her creation.” Yet, the human body is the most incredible instrument for gathering experience, for acquiring the incredible feelings possible, with “JOY” being the projected eternal target for each sincere “Child of God” wannabee. Though we all have the same potential, yet we have been given opportunity and ability to over-ride the original pure programming according to our individual free will to implant within ourselves alternative instincts. Realize that when trauma ensues for any one of us, that often those defensive strategies that are critical for the short-run become locked-in patterns of behavior. The body pays a price for maintaining these defenses too long by creating chronic stress. 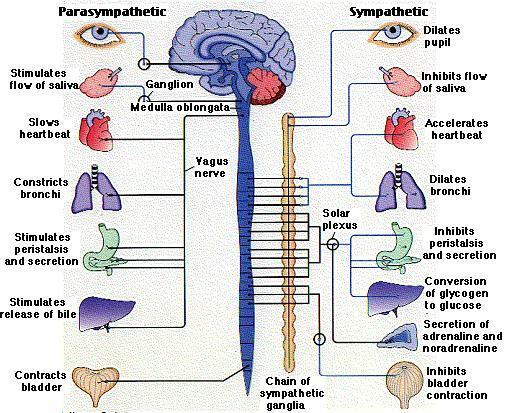 Stress of any kind indicates that one is out of one’s “right mind” by having overcome the ventral vagus nervous system with either the dorsal (through depression or immobilization of any kind) or with the sympathetic nervous system and its patterns of “fight or flight” (ADHD, aggression, anger, etc.) One of the reasons chronic stress is so toxic is that it both diverts the body’s resources to support an ongoing danger-defense response and, by essentially hijacking the autonomic nervous system, it reduces our capacity to regulate the health-producing physiological states that depend on the autonomic nervous system. Today, many individuals find themselves triggered into immobility (by the dorsal branch taking charge) or fear-based mobility (through the sympathetic nervous system at the helms) by a nasty boss, combative spouse, or alcoholic parent… rather than a raging tiger. Baffled by feelings of disengagement, dissociation, depression, and numbness (dorsal), or panic, anger and desires to fight (sympathetic), diagnoses may be offered. But any drug or therapy is simply a “band-aid” and a short-term fix, in other words, an inappropriate solution. Tomorrow, I will offer many other ways to “tune up” one’s emotional (and thus physical and mental) body.